before any kind of road trip, i always hit up tj’s. i think i learned this from my mother. she always packed the car full of snacks (including her favorite — tj’s popcorn) because who knows what will be available to you on the road and you want to give yourself healthier options (relevant to a big mac). so besides a big bag of almonds and some apples, my other go to road trip snack is powerberries. powerberries are “real fruit juice pieces made with acai, pomegranate, cranberry and blueberry juices and dipped in dark chocolate”. powerberries provide me with vitamin c and a somewhat natural sugar high all at once. the dark chocolate and fruit combo is money and i can’t get enough. i know costco has a similar product but can i let you in on a little secret? they are nowhere near as satisfying as powerberries. because the costco version has various sizes in their bag so you could get a berry as big as a cherry or as small as a raisin. there is no uniformity. their chocolate to berry ratio is all off because of the lack of consistency. and frankly the chocolate is waxy. what are your favorite road trip snacks? 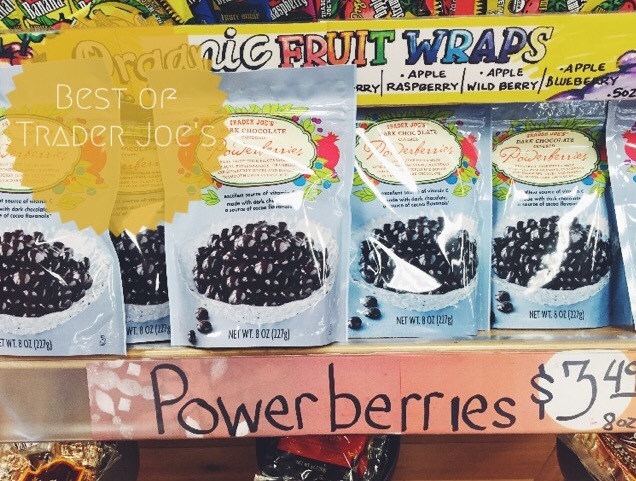 This entry was posted in Bites + Sips and tagged Powerberries, Review, trader joe's on 03/10/2015 by Ems. Documenting the little joys (travel, events + fashion) that make life beautiful. Please do stay a while!